Hypertrophic Cardiomyopathy (HCM) is an incurable, genetic heart disease that occurs in all cats, but has assumed Sphynx around the world in alarming proportions. It is not currently possible to determine the life expectancy of a Sphynx with HCM but some affected cats can live for many years, provided he/she properly follows treatment. 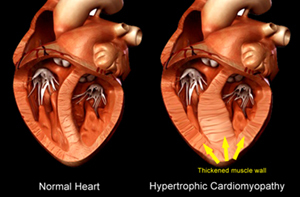 HCM is the consequence of anomalies on the chromosomes responsible for manufacturing various proteins constituting the cardiac muscle and is characterized by the inward thickening of the heart muscle, resulting in a reduction of chamber volume, thereby reducing the volume of blood that the heart can pump with each contraction. Asymptomatic pets may not need medical therapy depending on the findings of the tests listed above, but routine reevaluations will often be recommended. Other cats will need medications to slow the heart rate, and promote relaxation of the pumping chambers (ventricles). If arrhythmia or congestive heart failure signs are present, additional medications used may be required. Since this disease can be progressive, the number and the amount of medications used may change with time. Therapy is always tailored to the needs of the individual patient. If congestive heart failure is present, dietary salt reduction is also recommended. There is no genetic test as of yet for HCM and the disease can show up and take hold at any age. The only tool we have right now to look for HCM is annual echo-cardiograms starting at age 1. A board certified cardiologist will check and measure different points of the heart and use those measurements as a base-line for subsequent annual visits to see if any enlargement is occurring. Current research suspects that the gene responsible for the disease is a autosomal dominant inherited trait with incomplete penetration. The disease has variable expression; meaning some cats are severely affected, others are only mildly to moderately affected, and some cats may not have evidence of the disease yet produce affected offspring.